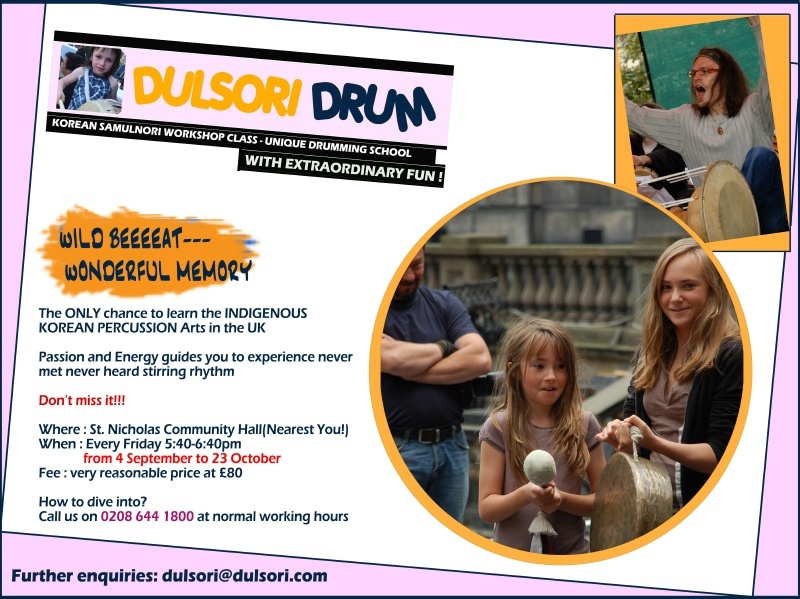 Don’t miss a rare chance to learn and experience the fun you can have playing samulnori percussion. Over the past few years Korean percussion group Dulsori have had a regular slot in the SOAS music summer school teaching percussion for a week. This year they’ve gone independent, and will be giving weekly classes over an eight-week period. Having so much fun for so little money shouldn’t be allowed, and I’m surprised there isn’t a law against it. Eight weekly classes of an hour each, plus some homework (you need to get those rhythms into your head for the performance). The SOAS classes were all packed in to one week: you can read all about how they went here. Dulsori (literally ‘Wild beat’) aims to preserve and promote Korean traditional Art forms in a contemporary context. This energetic and passionate troupe has staged hundreds of international performances around the world. Dulsori also conducts workshops and classes on Korean traditional arts and are open to all age groups. Dulsori has several sorts of workshop program to let people get to know Korean tradition and have fun with it. One of the most famous workshop programs is ‘Samulnori’ which teaches very basic rhythms using four Korean traditional instruments played by farmers in the countryside. The instruments are called ‘Jing’, ‘Kkwangwari’, ‘Buk’ and ‘Jang-gu’. The contents of this course are the Samulnori basic course and an intensive course for students who want to learn in-depth Samulnori. Apart from the basic course, this course teaches more complicated rhythm and skill with where to breathe while playing. Learn the rhythm and culture of Korea with full passion and energy, and experience a new sense of togetherness! You will find yourself smiling to your new friends with exhilaration and joy. Memorize each part of the instrument ‘Janggu’. What is Chuimsae? Guess and learn. Dulsori’s gig calendar (you can also listen to some audio tracks on this site). Love to try it out, just a bit too far from where I work and live. i want to apply for this amazing lesson with my friend. how can i apply and how about the fee?? i am waiting for your reponse. What's the official story on the Clinton visit?